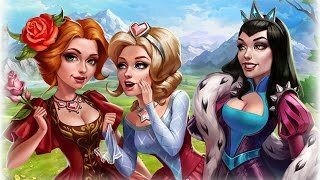 To turn up in a beautiful medieval castle or take part in a tournament, feel the spirit of romanticism and learn about the nobility of the gentlemen is now real, because this tells the game Loyalty: Knights and Princess. Toy makers realized not just a plot, interesting for both sexes, but also forced them to contact. And the closer the conversation, while the players will be in Loyalty: Knights and Princesses play, the more tangible the positive result. Women-centered girls take care of the garden and farm, prepare food. This contradicts the prevailing ideas about princesses, who are supposed only to be capricious, to dance at balls and to tell the suitors cunningly harmful riddles, but do not argue with the authors. News young men spend most of their time in a military camp, honing their knightly skills in order to provide protection for the young and beautiful maiden. B Fidelity: Knights and Princesses registration is needed, since the game is browser-based. After passing through a simple procedure, you will become part of a magical world in which pleasant discoveries await you. Princess will grow livestock, harvest crops, prepare dishes, decorate the estate, and even make crafts. But these simple activities will only strengthen the sympathy of the knights, which guarantees them certain benefits. Knights compete in the demonstration of courage and strength in tournaments, and prefer soft beds to the beds of the military camp. Gradually, their armor and weapons wear out, and you need to update them by buying in a shop or making a forge. Income is expressed in the number of coins and rubies. Especially valuable items are exchanged for rubies, and you can get them when completing quests and levels by posting news on your game wall or exchanging for the voices of friends. Coin knights receive, performing various assignments and after each victory in the battle. And the princesses are enriched while working on the farm, and also performing tasks. There is another type of property collection. In this section, things fall from the chests or can be found in the grass. A princess gets them after a stone is destroyed, a tree is cut down or on condition of a good harvest of fruitful trees. Prince, to become the owner of the gift box, must look to visit the princess. She treats the gentleman to dinner, and after his meal will remove from the table. Only then will the little chest appear, which the knight will pick up.
. The characters need to earn fame by doing the work of neighbors, some work or receiving guests. Knights will find a bonus near the tent, and princesses in their mansion. Bring glory as joint actions of the heroes. The princess will feed the prince with a cooked dish, and he will bring her glory. Then he goes to the tournament and, in the event of his victory, pieces of glory are already given to both. But this is only if they are engaged or sympathize with each other. The princess, who has a protector, knows that her castle is protected, and the neighbors will not steal her chests and bird nests.